Fill in the returns form within 14 days of your delivery date, and we'll send you a CRA number (customer return authorisation). Now, please read our Returns rules below. Faulty item? Please email customer services or call us on 0800 432 0722 to discuss either a repair, exchange or refund. Need to discuss something before you return it? 1. Include your CRA number with your items. 2. Check items are in the same condition you received them in, along with the original packaging and all manuals and accessories. 3. 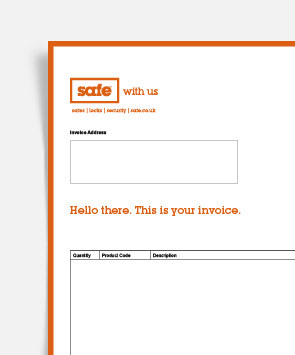 Send your items to Safe (or named agent, if applicable). We can't reimburse your post and packing costs, unfortunately. - Made-to-order items, such as cut keys, keyed alike locks and lockers. - Products with bespoke modifications that aren't available to order online. - Any upgraded chargeable delivery services, but most deliveries are free anyway. - Items that have been installed. - If your item has been installed we might be able to offer a partial refund based on diminished value. 6. We'll refund you once we receive your item back, but it might take up to 28 days to appear on your statement.